I was taking a break today and looking at TV when a U.S. entertainment show came on. First it's a U.S. show and that's OK, in Australia most of our culture is Northern American-based – even our indigenous culture hasn't escaped. For example I was watching a show made by Australian Aborigines about the outback and there in the background was a group of Aboriginal kids doing hip hop and break dancing to a boom box – sigh. Back to the show. I found myself being utterly overwhelmed by the barrage of sound and sight bites, and 'promos' one on top of the other, relentlessly until I finally turned it off in utter frustration and my self talk? 'I can't stand this one more second'. This was no way to have a relaxing break! I felt as though my senses had been thoroughly assaulted. I was appalled to hear them proclaim themselves the number one show in America and here's why I was so concerned. I have long held the belief that extremely fast-paced scene changes – flashing from one scene to another – loud noises, explosions especially - might be exciting but also that it might be just a little too exciting for our brains. This many stimuli – sometimes of a horrific or violent nature – is assaulting to the brain and can have serious effects on our mental health, either making us very stressed as we try to take it all in and cope with it, to over-exciting us – making us 'hooked' on this kind of fast-paced entertainment found in film, television and video game media. On the same day that I was watching the entertainment show (for at least the minute or so I could stand it) I had also finished re-reading a marvellous new book called 'The Brain That Changes Itself: Stories of Personal Triumph from the Frontiers of Brain Science' - by Norman Doidge MD, on one of my favourite subjects – Neuroplasticity – that is, the ability of the brain to form new neural pathways very quickly and adapt to internal and external circumstances. Here's the co-incidence. On this very day that I was watching the entertainment show, I read this brief extract from the book, (which I encourage you to read - it's beautifully written and very accessible). 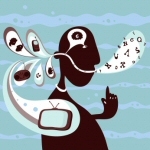 So these media do change our brains – they adapt to faster and faster stimuli. So what is different about my brain? I have always instinctively avoided these extreme kinds of stimuli and therefore my brain has not adapted. What might have seemed perfectly normal to a large part of the viewing audience was overwhelming to me to the point where I felt compelled to turn it off. Doidge also points out the addictive nature of video games in his book, because they activate the pleasure centre of the brain and produce the 'feel good' neurotransmitter Dopamine. He also emphasises the way in which our brains interact, even mesh with the media, in a manner that is on the one hand an adaptive wonder and on the other hand comes at a cost. He points out that 'The cost is that such activities as reading, complex conversation and listening to lectures becomes more difficult'. As a result, we are 'dumbing down' in response to an inability on our part to pay attention to anything that does not constantly stimulate us. Our language is shrinking and our communications are becoming 'text lean' (emails and SMS messages say very little and can be emotionally confusing). As someone who made a living being a radio journalist for over 20 years, as well as being a psychologist, I am no stranger to being a 'quick thinker'. However, I have now come to an understanding that I have chosen to avoid adapting to the pace of a lot of media today and I will continue to choose to avoid it, because I don't like what it does to my brain and my senses. Instead I will continue to enjoy the World Wide Web and media that is satisfying and enriching; and that stimulates my senses in subtle and interesting ways. My plastic brain has better things to do - but if you love zooms, pans, cuts and booms? Good for you, you've formed new neural pathways and you're brain is adjusted (just don't get addicted). Please think about reading Doidge's terrific book, here is the link to his official website. Here's another great book 'Train Your Mind, Change Your Brain by Sharon Begley. You can find out information about her by visiting this site. Also try these sites on brain fitness. They have interactive brain exercises and information.